What is the weak force? There’s a reason why the weak force is often described as “something something, radioactivity.” It was radioactivity that provided the first hint of the weak force, and it remains the most prominent physical phenomenon driven by the weak force. It all started back in the late 1800s, when Marie Curie and others began to study radioactive materials. These materials were odd because they released high energy rays seemingly in defiance of conservation of energy. By the early 1900s, Curie had shown that radioactive decay caused atoms to transmute from one type of element to another. The energy of these radioactive rays was provided by a transformation of mass into energy. 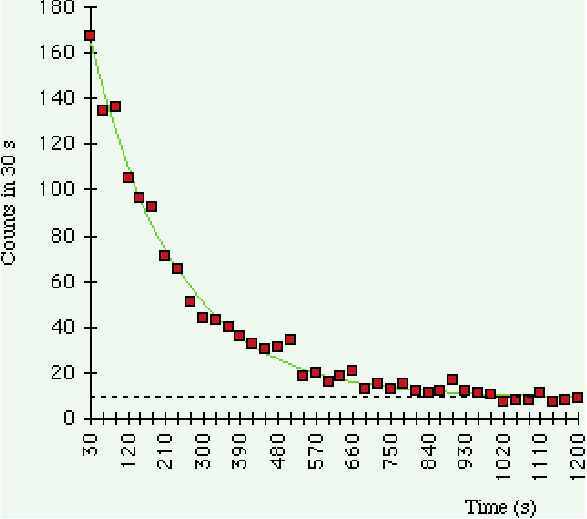 As we observed the rates of radioactive materials, we found they decayed at a rate proportional to the amount of radioactive material. That is, radioactivity followed a half-life relation, where in a given period of time half the material would decay on average. By the 1930s we had a good understanding of how radioactive materials behaved, but no real idea as to why they exhibited that behavior. The first step toward a theory of radioactive decay came from Enrico Fermi in 1933. Fermi’s model focused on beta decay, where a single neutron would decay into a proton and electron. One of the odd things about beta decay was that the energy of the emitted electrons varied. According to Einstein’s theory of special relativity (E = mc2), the energy of the electron should be the difference in energy between the neutron and proton, and should always be the same. To answer this mystery, Fermi proposed a new particle known as the neutrino. If a neutron emitted both an electron and neutrino when it decayed, then the neutrino would take some of the energy. The result of this model was known as Fermi’s golden rule, which seemed to explain how the half-life relation might occur. Periodic table for elementary quanta. Since the neutrino was chargeless (and presumed massless) it is tempting to imagine neutrinos playing a role in the weak interaction just as photons do in electromagnetism. It was soon clear that this wouldn’t work. As particle physics began to find a wide range of particles, their radioactive byproducts didn’t follow relations that neutrino mediated decay could explain. 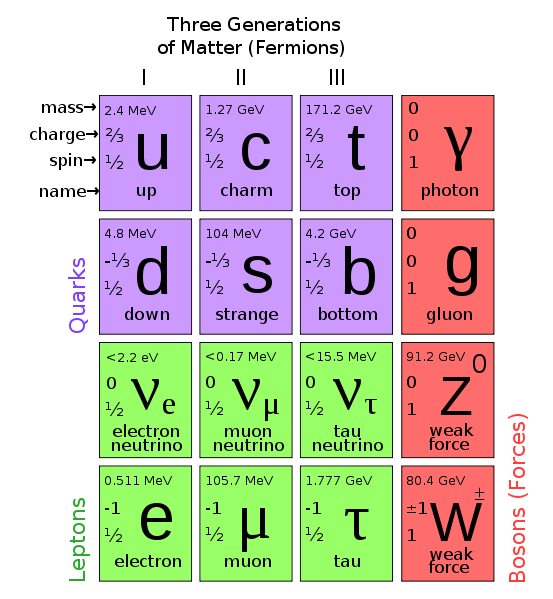 When the quark model was proposed, we found that rather than three elementary particles (electrons, protons, and neutrons), there were in fact twelve. These could be grouped into six quarks (up, down, charm, strange, top, and bottom), and six leptons (electron, muon, tau, and their corresponding neutrinos). Whatever this weak interaction was, it could cause heavier quarks to decay into lighter ones, and heavier leptons decay into lighter ones. With the development of quantum electrodynamics for electromagnetism, and quantum chromodynamics for the strong interaction, we had an approach to consider. In both of these models there are charges (electric and color) with field quanta mediating their interactions (photons and gluons respectively). Even gravity can be approximated as mass “charges” interacting through gravitons. So what if quarks, leptons and neutrinos have a kind of “weak” charge that acts through a field quanta. This idea turns out to be right, but the details are complicated. We can see some of this complexity in the type of field quanta the weak has. In electromagnetism, the photon is both massless and chargeless, and so can act over long distances. In the strong interaction, gluons are massless but have color charge. Because of this, a boson interaction causes a quark to change color. 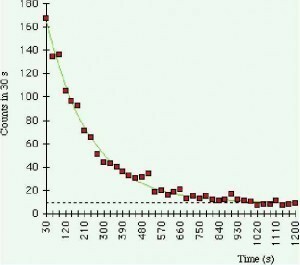 In radioactive decay (such as the beta decay of a neutron) particles change mass. This means the field quanta of the weak interaction must have mass. It turns out there are three field quanta. One is uncharged, and is called the Z. The other two are called W particles. One has a positive electric charge, and one has a negative electric charge. You read that correctly. Two of the weak quanta have electric charge. They must have electric charge to in order to interact with quarks. For example, a neutron consists of three quarks (one up and two down). Since the up quark has a charge of +2/3 (where -1 is an electron charge) and the down quark a charge of -1/3, the three add up to 0. A proton, on the other hand consists of two up and one down, with a charge of +1. In order for a neutron to decay into a proton a down quark must become an up quark, and thus gain a charge of +1. The charged W quanta lets that happen. Just as a gluon interaction allows quarks to change “color,” the W interactions allow quarks to change mass and charge (and thus type). The weak interaction is, quite literally, radioactive decay. Since the weak quanta have mass, they can only interact over short distances (just like Yukawa’s pion interaction between protons and neutrons). This is why radioactive decay occurs within atomic nuclei, but not between atoms in a molecule. 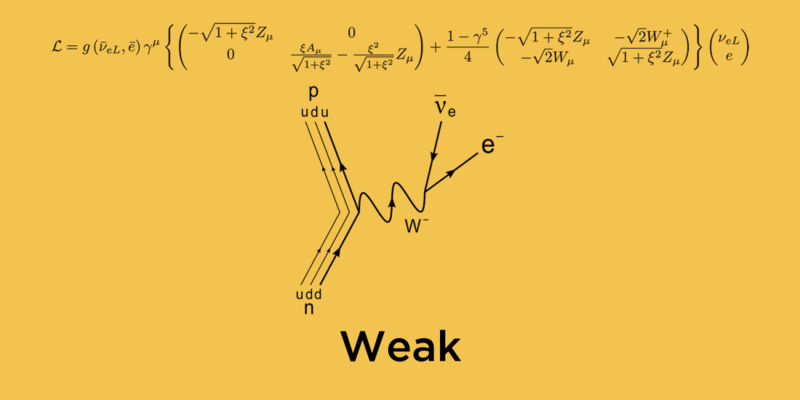 The fact that weak interactions can involve electric charge would seem to hint at some connection between the weak and electromagnetic forces. In 1968 Sheldon Glashow, Abdus Salam and Steven Weinberg showed just how they were connected by introducing the electroweak model. Just as electromagnetism unified electricity and magnetism as a single theory, the electroweak model unified electromagnetism with the weak, showing that the Ws, Z and photon are all related as electroweak quanta. This unity only becomes significant at very high temperatures, such as during the early moments of the big bang. Its success has led to work toward unifying the electroweak and strong into a grand unified theory (GUT), with dreams of even uniting gravity in a theory of everything (TOE). Whether or not that’s possible is yet to be determined, but for now we understand the weak interaction as the foundation of radioactive decay. We normally think of radiation as being harmful, and sometimes it is. But we also wouldn’t be here without it. Our Sun is powered by nuclear fusion, just like all other stars. While the fusing of lighter nuclei into heavier nuclei requires the strong force to hold them together, fusion sometimes need a little help. 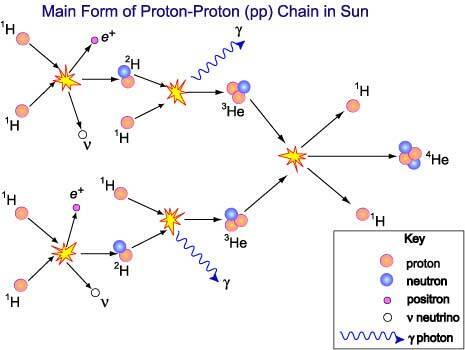 In “small” stars like our Sun, the first step in the fusion chain is when two protons come together. The strong force can’t hold two protons together easily, so usually two protons come together for a brief moment only to fly apart again. But sometimes when two protons are together, a W quanta can interact with them, and one proton decays into a neutron, positron and neutrino. 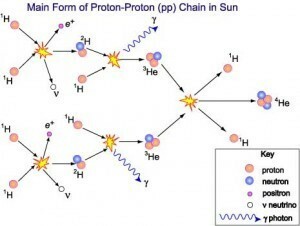 The strong force can hold together a proton and neutron (which we call deuterium), and collisions with deuterium eventually lead to helium. Without that simple weak interaction, smaller stars (the kind that burn for billions of years) couldn’t fuse hydrogen to helium. Without the weak force, there would be no Sun-like stars for Earth-like planets. We notice gravity and electromagnetism in our daily lives, but it is the strong force that built the atoms in our bodies, and it is the weak force that has allowed the Sun to nurture life on Earth for billions of years. Miss the beginning of the fundamental force series? You can find it here. Can We Break The Laws of Physics? Thank you so much for the whole series but specially this one! I understand the weak force much better, now. 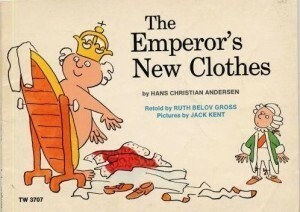 Might have to read it again in a few weeks… This stuff is not easy for a layman! I guess the simple part is, the weak interaction is mediated by the W + and W – bosons and the Z boson. When the nucleus gets too big, the strong force cannot hold the nucleus together because of the repelling positive charges inside the atom. Then the weak force causes the atom to break up into smaller atoms and particles releasing electromagnetic energy. Some of the atom’s mass has been transformed into energy- a Nuclear Chain Reaction, it is. Could you add a potential diagram here as well? Absolutely loved your work! The way you described the forces and the interactions of various fundamental elements is right on cue. I must have read hundreds of books and articles throughout my college life and after, always interested to understand the secret of our universe but maybe you opened up a small potion of that immense knowledge and may very well spearhead a group of fellow enthusiasts, with similar passions and interests with the information you just shared.